If one did not know any better, he or she might conclude that the single most important function of the President of the United States is to secure the computer email systems of the nation’s privately run major political parties against intrusion by foreign intelligence agencies. Or, that the only topic of importance that was discussed at the Helsinki, Finland summit between U.S. President Donald Trump and Russian President Vladimir Putin on July 16 was charges brought by Special Counsel Robert Mueller against Russia’s GRU for hacking the Democratic National Committee (DNC) and John Podesta emails and publishing them on Wikileaks on 2016. Such is the hysterical world that we live in today. Believe it or not, however, the President, whoever occupies the office, really does have even more important issues to contend with. Don’t believe me? 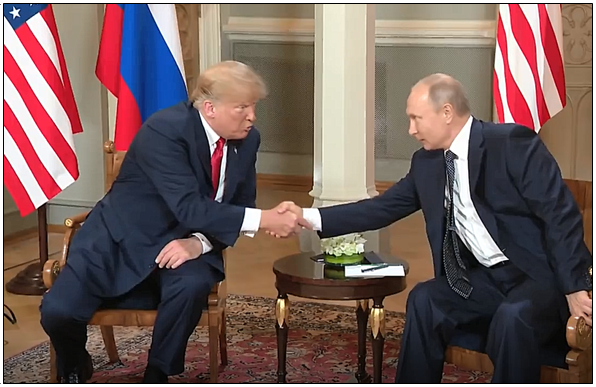 When it comes to U.S.-Russian relations, there are very real geopolitical issues between the two countries, the world’s foremost nuclear powers, where cooperation between the two presidents could bring about better outcomes than conflict. That is the major reason to have a summit. In short, to prevent war, but more broadly, to address differences and, if possible, to find areas of agreement. Fortunately for everyone, President Trump did find those areas of agreement. On nuclear proliferation, current disagreements between the two powers over the implementation of the 1987 Intermediate Nuclear Forces (INF) Treaty, which banned all nuclear weapons with ranges from 310 and 3,420 miles, were reportedly addressed. Both the U.S. and Russia have said each side is in violation of the treaty with the development of ground-based missile systems banned by the treaty. For the uninitiated, the INF Treaty is the bedrock of the U.S.-Russian nuclear arms control regime. It was Ronald Reagan and Mikhail Gorbachev’s crowning diplomatic achievement and signaled the coming end of the Cold War. It set the stage for the Strategic Arms Reduction Treaty (START) of 1991. These two treaties were the first ever reductions of nuclear weapons. So, the fact that the agreements are now failing would be a matter of concern for not just the U.S. and Russia, but for the entire world, because they threaten world peace. A new nuclear arms race would be a catastrophe. It would also be an urgent matter for the U.S. and Russian presidents to address, which, thankfully, they did when they met on July 16. Now, it will be up to the national security councils of both nations to follow up and see about bringing each side into compliance with the INF Treaty. No new agreement is needed. Simply implementation of the existing treaty, which calls for monitors, analysis and demonstrations to test the ranges of the missile systems. Other areas of agreement came, again on the nuclear front, where Putin was said by Trump to support the President’s agreement with North Korean leader Kim Jong-un to denuclearize the Korean Peninsula. Being a nearby neighbor of North Korea — the two countries share a border of 11 miles — Russia is in a position to apply both pressure and give encouragement to North Korea to make good on its agreement. Russia, a net exporter of petroleum and natural gas, is also in a position to factor into the sanctions regime. Again, achieving agreement here on Korean denuclearization is better than not having agreement. This is something that both sides can play a role in facilitating, along with China, and keeping everyone on the same page. It’s helpful to have Russia involved as a positive force. It’s certainly better than if they were actively undermining the agreement. In Ukraine, the Trump and Putin discussed the implementation of the 2014 Minsk Accords, which is a Russian-Ukrainian agreement to help settle the civil war there. Since that is a location where U.S. and Russian forces could realistically and potentially wind up in armed conflict, it is extremely important that the U.S. and Russia be on the same page. Elsewhere, the U.S. and Russia via Trump and Putin agreed to work towards the security of Israel’s borders. This follows on Israeli Prime Minister Benjamin Netanyahu’s recent trip to Moscow to discuss Russia helping to keep Iranian forces operating in Syria away from the Syrian-Israeli border. Obviously, there are many complexities to the situation on the ground in Syria presently, but again, this is an area where Russia could help a lot to defuse the situation and prevent a wider war in the region, which again, could involve the U.S. and Russia at opposite ends. With both U.S. and Russian forces operating in theater, getting deconfliction right is critical. The two sides must be talking. By the way, there are no guarantees the cooperation between the U.S. and Russia will work out in everyone or even any one of these areas. That really depends a lot on the relationship Trump manages to establish with Putin and how well they can work together. Scoff if you will, but these talks are utterly necessary. We don’t boycott U.S.-Russian relations just because Hillary Clinton lost an election. Sorry. There’s more at stake than partisan politics. Yes, the issue of the 2016 hacking was also addressed at the summit by Trump and Putin, but quite honestly, it pales in comparison to the threat of war. Which is more important? Preventing an accidental nuclear war or finding out who sent the spear phishing messages that enabled hackers to access John Podesta’s emails? That’s a rhetorical question, by the way. Now more than ever, we need to have a president who can initiate a direct, one-on-one conversation with Russia to defuse these conflicts and set the world on a path towards peace and security, not take us to the brink. Right now, that is President Trump. And thank goodness he is doing his job. In the nuclear age, every day we wake up is a gift. Never forget it.